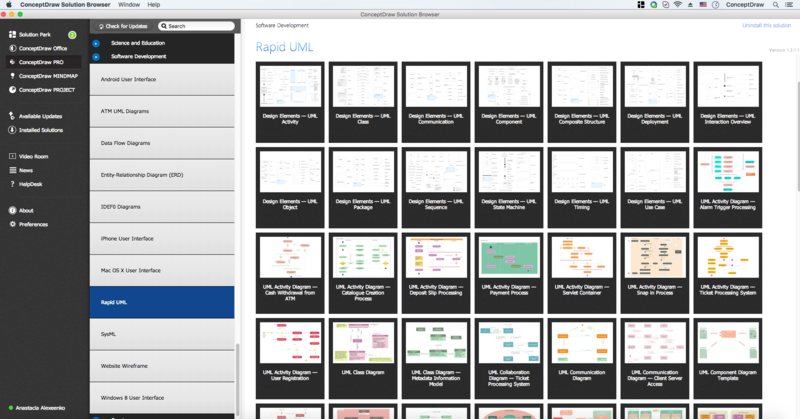 UML Diagram Software - ConceptDraw for Mac & PC. Create uml diagrams, use case diagrams and more. Free Download! To draw a diagram, just drag the required objects from the corresponding library onto the document page, then connect them with connectors appropriate for diagrams of this type. Diagrams of this type represent a list of operations performed by the system. Such diagrams are also called functional diagrams, as the list of the system's functions is created based on them, in accordance with the specified requirements. Use case diagrams are used to describe business processes in automated applications and to define requirement for software to be developed. They depict objects from the system and application domain as well as the tasks performed by them. UML diagrams of this type serve to analyse the hardware used in system implementations, interaction between the processor and other components. As a rule, such diagrams are used in the beginning of designing to determine the hardware configuration of the system. Statechart diagrams serve to model possible states of the objects in the system. They also depict the sequence of actions required for transition between the states. Same as Statechart diagrams, such diagrams show the states of objects in the system. The difference is that they can also depict forks for transitions from one state to another. These diagrams can be used to describe behavior algorithms of objects. You may also use them to create flow charts. 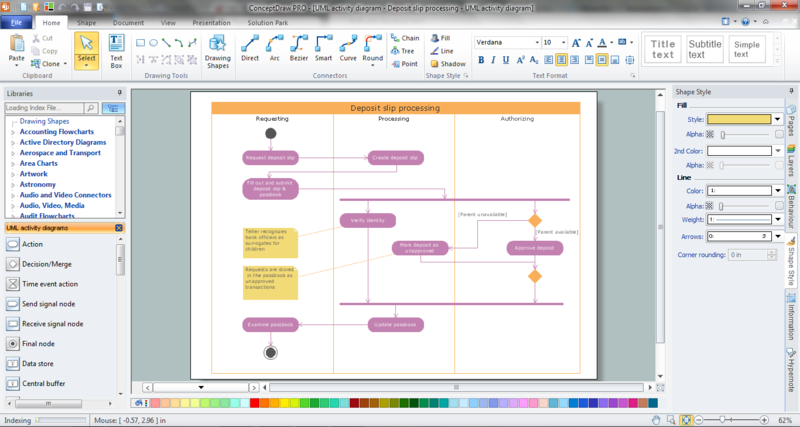 In ConceptDraw DIAGRAM such diagrams are represented in the UML Activity Diagram library. A type of interaction diagram. Sequence diagrams describe a sequence of interactions between objects. To draw such a diagram, use the UML Sequence Diagram library. A collaboration diagram is also a type of interaction diagram, but unlike sequence diagrams these diagrams instead of the sequence of interactions between objects describe all variants of such interactions, regardless the sequence. They help to create graphical logical models of a system, further used to create the source code for the classes represented on the diagram. UML class diagrams describe relationship between classes and interfaces. We recommend to create class diagrams using the Booch OOD template from the ConceptDraw STORE. On diagrams of this type, also known as module diagrams, classes and objects are distributed by components or modules. This is very convenient for designing large systems which may count hundreds of components. Use the UML Component Diagram library for drawing diagrams of this type.